Within the last few days or so I got a brand new shipment of jewelry in for my store! Reyèl, which you can read more about here, is my online store featuring jewelry (earrings, bracelets and necklaces) made by Haitian artists. Since my recent trip to Haiti I wanted to help the local people there somehow by helping them help themselves. While a gift can go a long way and be a major blessing to these precious people, another way to help end the cycle of poverty in Haiti is by creating new jobs for the people living there so that they in turn will be able to provide for themselves and for others. The poverty in Haiti is heartbreaking. A lot of men and women can’t break this cycle of poverty because of inadequate funds. Of course there are a lot of layers to this problem such as a lack of education, homelessness, deforestation and more; however, by providing business opportunities to the local people and partnering with them, we can then help begin to address the problem of poverty one step at a time. Reyèl is a business that seeks solely to partner with Haiti’s Jewels and help address this very problem. Which is why I’m excited to share with you some of the new pieces of jewelry over at the store! Below are three of my favorites! 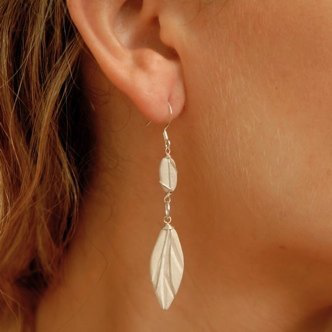 These double tier feather stone earrings are strikingly stunning! Hand carved and made with soap stone, these earrings are bound to become a personal favorite to anyone’s jewelry collection. Earrings are wrapped in sterling silver and hung in hypo-allergenic backings. Hand shaped, recycled aluminum cuff bracelet. A great piece for a casual look! Handmade recycled aluminum cross, cast in a sand mold. Cross is strung on brown, goat cut leather and fastened with aluminum button. This necklace is made with locally sourced goat leather making it 100% Haitian made! Lastly I wanted to let you know that the Silver Drop Glass Earrings (in colors green, blue, brown and clear) will be discontinued. I only have a very limited amount left so feel free to grab a pair before they are all gone. They have been my best sellers so far!! There are plenty more pieces over at my store which you can visit by clicking here. The artisans who make this gorgeous jewelry have been able to create steady incomes because of their craft and business. They are mothers, fathers, sisters, brothers and friends who now have the opportunity to pay for medical treatment, send their kids to school, feed their families and buy a home!! By coming together we can make a difference in the lives of others. Let’s help to end the cycle of poverty in Haiti one step at a time. Change is more than possible!